A classic recipe for old fashioned Salmon Patties (or Salmon Croquettes) pan fried until golden brown and delicious! When you can feed a family of five on a $3 can of salmon, you are officially winning at life. It's no hardship for me to eat salmon patties. I love them. Growing up we usually had them with rice and stewed tomato gravy. And I like to serve mine with grits too! I like to smoosh them up in the grits and douse it all with hot sauce. The recipe isn't rocket science and everyone makes theirs a little differently. My mom's from Maryland so I've got a little Old Bay in my blood and I use it frequently with fish. The old school way to make them is to use yellow mustard. I imagine that's because recipes like this came from hard times and people living in hard times don't usually have fresh lemons around the house (the acid in the mustard functions the same as the lemon juice to balance the fish). This is just a good base recipe. Feel free to jazz it up however you like! Remove skin and bones from salmon if desired. Combine salmon, mustard, egg, onion, Old Bay, salt and pepper then stir with a fork until just combined. Add bread crumbs then stir to incorporate. Shape in six patties. Add just enough vegetable oil to a large skillet to coat the bottom well. Heat over medium heat. 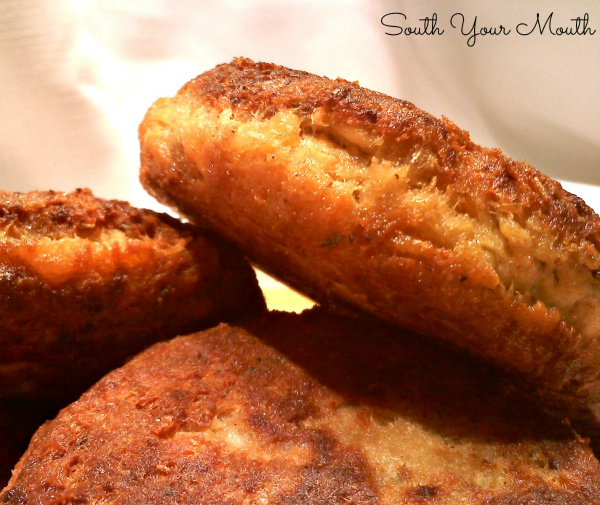 Pan-fry salmon patties 3-4 minutes on each side or until golden brown. *If you don't have any Old Bay, use a combination of celery salt and paprika. I wish my husband would learn to like salmon patties. My husband never liked them. For many years, when I wanted to go out to eat, I would just have a can of salmon sitting on the counter when he got home for work as if that was the supper plan. I think I used that same can for years until we moved! We never used mustard or old bay, just salt, pepper, onion, egg and flour to bind. I like 'em crunchy so after I make patties I dip them in a little corn meal. Keeps them from being mushy too. LOVE these, with blackeye peas & yellow rice and fresh sliced tomatoes. OOOOO Never thought of coating them after, I usually just mix the flour and meal in together Cool! Add a bit of crushed corn flakes ro the corn meal for extra crunch! Coat them with crushed potato chips also is good. I have a similar recipe but you make a white sauce and add to the salmon mixture. Using Ritz or some other cracker instead of breadcrumbs is a nice change. Love salmon patties! IBe sure to drain the salmon; then add 2to 4 T Carnation milk with the other ingredients......very good. OK< I am the "anonymous" who adds the Carnation !! I make them with chopped onion and celery, orange zest and the rest of your ingredients. My friends love them. Love salmon patties with a side of macaroni and tomatoes and fried okra. I love them with macaroni & tomatoes and sauted spinach. Can salmon is from USA, use red or pink, not chum. I use flour, not bread crumbs, and coat them in a little yellow corn meal for crunch. Hey- here in the south we use corn meal a lot! Can't keep these around for 2 meals, everyone munches on them and they're gone. I've never tried the mustard and Old Bay either, just the flour, egg, salt and onion; then we serve them with a creamy dill sauce and they are delicious - one of our favorite meals! Do you make the dill sauce from scratch??? That's what we often had with salmon patties too! I've not made it in years but you're not the first person to ask so I might just have to whip some up this weekend! I use tuna instead of salmon, everyone loves it! I use fresh trout that I can. Very good! I can't stomach the canned salmon cleaning process, but isn't there salmon in those pouches that has the skin and bones removed nowadays? I'd make this recipe if so, and rejoice to be eating one of my favorites from childhood. How much of the can is left over after you remove the junk, would you say? Two-thirds, maybe? I could compare ounces and make sure I got enough if this would save me from cleaning the canned salmon. My family has always just taken a fork and mashed the bones and skin. Bones are so soft they fall apart. Mixed together with the flaked salmon, no one would ever know that it's all in there. I didn't know anyone bothered picking all that out until a co-worker mentioned it. She's mashing it all together now. Much less time consuming. My family has always just ate the skin and little BONES, very removed them or mashed them. They are soft and very edible, add a little crunch that all my kids enjoy. It's cool because they can "eat bones!" I ALWAYS, ALWAYS, remove as much of the bones as possible. It is just a personal preference and they are so few that it doesn't require that you alter the other ingredients. You can use the pouches, you just have to alter the number of packs to your personal preferences. This is a recipe you just can't go wrong with. Sometimes I buy salad shrimp, toss with dill, a little garlic powder, and make shrimp stuffed salmon patties. Try dill instead of old bay and no filler no egg just mayo and onion then salt pepper and dill!!!!!!!!!!!!!!!!! I go crazy! 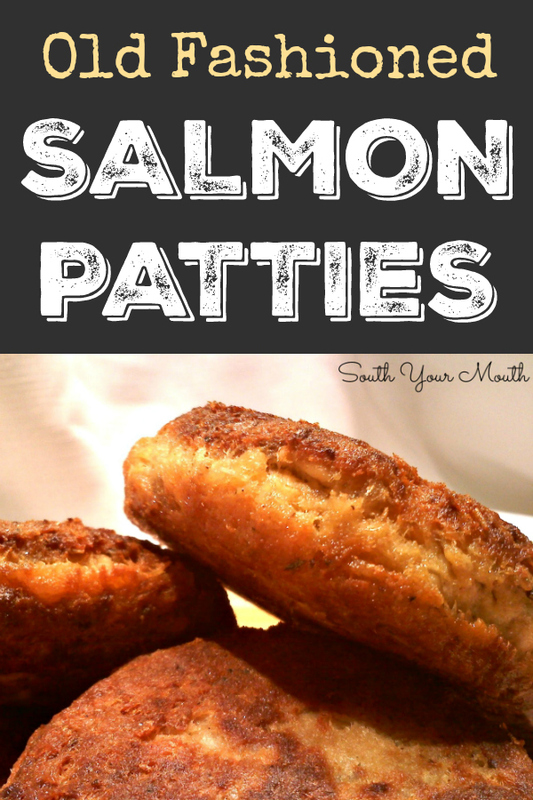 for Salmon patties, they are wicked yummy. My Mother-out-law introduced me to them back when I was married, pretty yummy stuff! I make it the same way just without the old bay. And I make a yummy sauce with cream of mushroom soup and a few handfuls of shredded cheddar cheese, creamy cheesy goodness!!!! Yummy!! Do you drain the salmon? I'd like to know also. Ok, Missy, you mentioned you used to eat this with stewed tomato gravy and there is no recipe. This sounds really good, can you please share? Thank you. Oooooo I remember stewed tomato gravy too. Please let us know if you add the recipe for that. 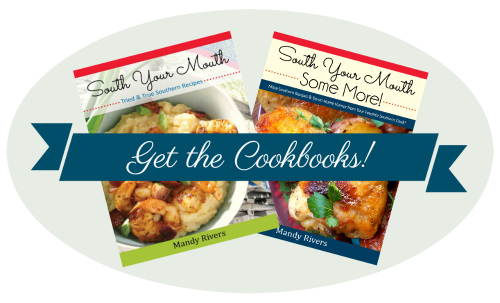 I'm still learning the southern cooking from my summers with my grandparents (northern girl here). How big of a can of salmon? These look sooooo yummy! Clean the canned salmon? That skin is very, very good for your heart and the bones you're tossing into the trash are an excellent source of calcium for bones and teeth. Yes, there are issues with canned fish, but unless you're pregnant, feel free to enjoy this once in a while just the way it's found in your pantry. I use crumbled gold fish crackers instead of bread crumbs and season with Lawry's Seasoning salt (sometimes mix in some shredded cheese too). Yummy! My ex mother-in-law puts dill relish in hers. No mustard or Old Bay, but the relish gives them an interesting tang. My mama used to make a Salmon Gravy. Best I can remember she put the canned salmon in a skillet, added flour, stirred it till flour was cooked, then added lots of milk. She stirred it till it was thick. Checking on seasonings thruout . We would ladle it over hot home made biscuits. Very good. Does anyone have a recipe for this? I do love Salmon Patties and most anything relating to salmon. My mom did that, too. All 5 kids and Daddy adored the gravy over hot biscuits. I wish I had her recipe. I am going to try and make it from memory (same way as your mom did) and figure it out from trial and error. However, I am going to try it with fresh salmon first. Then canned and see if there is a great deal of difference. The salmon gravy/sauce is made almost like regular gravy. Use butter to saute salmon. Remove salmon. Add your flour, salt and pepper. Gently stir till smooth. slowly add and stir milk into this till thickness desired. Check seasoning and add more if desired. I also like to make the patties, then use the drippings for sauce/gravy. Pour small amount over patties, but not over potatoes. I tried this several years ago, just on a fluke, and loved it. I like green beans stewed in tomatoes or bread torn and stewed in tomatoes for a side. Any form of potatoes go with salmon patties. So does salad or baked beans. Most of this is fattening (not green beans and stewed tomatoes). the juice,skin and the bones are all fine and dandy to eat,its all in your preference. Made this for dinner, family enjoyed it, thanks ! my husband loves seafood but i do not. i just used canned chicken and the same seasonings to make me chicken patties and make his with salmon. My son like this! I will try one for him! I use instant stuffing mix in place of bread crumbs and 1 egg instead of two plus a dollop of mayo to help hold together. (probably takes the place of mustard or lemon since I use Duke's and it has a natural tang to it) If I use cornbread stuffing mix I dust it with corn meal before frying. I also use Bearnaise sauce on top. Yummy! I just made salmon patties Tuesday eve for supper. Served them with creamed peas. I grew up eating both and still love them both to this day. Growing up I ate my salmon patty (yes, with so many mouths to feed, I only got one) between two slices of white bread spread with mustard, so it would 'stick to my ribs' as mom would say.